Smulders MJM, Cobben MMP, Arens P, Verboom J (2009). Landscape genetics of fragmented forests: anticipating climate change by facilitating migration. iForest 2: 128-132. Habitat fragmentation is a threat to the survival of species and causes population decline, as isolated populations are more susceptible to demographic and genetic stochasticity. This can be compensated for by sufficient spatial connectivity between habitat patches to allow dispersal of individuals among populations. In that case such a network of populations may effectively form a metapopulation. In this paper we discuss some aspects of metapopulation theory, notably with respect to maintaining genetic diversity in fragmented forest patches. In addition we will discuss recent studies that explore ways for forest management to anticipate and mitigate the expected climate change, in relation to range shifts and colonisation opportunities. Genetic consequences of habitat fragmentation in plant populations: susceptible signals in plant traits and methodological approaches. Molecular Ecology 17: 5177-5188. Molecular genetic analysis of black poplar (Populus nigra L.) along Dutch rivers. Molecular Ecology 7: 11-18. Genetic structure in populations of an ancient woodland sedge, Carex sylvatica Hudson, at a regional and local scale. Plant Biology 7: 387-396. Forests and climate change - lessons from insects. iForest 1: 1-5. Forks in the road: choices in procedures for designing wildland linkages. Conservation Biology 22: 836-851. Landscape structure and boundary effects determine the fate of mutations occurring during range expansions. Heredity 101: 329-340. Why the conservation of forest genetic resources has not worked. Conservation Biology 22: 267-274. The synergistic effect of combining woodlands and green veining for biodiversity. Landscape Ecology. Susceptibility of common and rare plant species to the genetic consequences of habitat fragmentation. Conservation Biology 21: 823-831. Forest fragmentation effects on patch occupancy and population viability of herbaceous plant species. New Phytologist 166: 723-736. Effects of coppicing on demographic structure, fruit and seed set in Orchis mascula. Basic and Applied Ecology 9: 392-400. Effects of population size and forest management on genetic diversity and structure of the tuberous orchid Orchis mascula. Conservation Genetics 10: 161-168. Genetic effects of chronic habitat fragmentation. Proceedings of the National Academy of Sciences USA 103 (21): 8096-8100. The paradox of forest fragmentation genetics. Conservation Biology 22: 878-885. Bridging the gap between ecophysiological and genetic knowledge to assess the adaptive potential of European beech. Ecological Modelling 216: 333-353. How well can existing forests withstand climate change? In: “Climate change and forest genetic diversity: Implications for sustainable forest management in Europe” (Koskela, J, Buck, A, Teissier du Cros E eds). Bioversity International, Rome, Italy, pp. 3-17. Potential impacts of a climate change o forest ecosystems. European Journal of Forest Pathology 23: 28-50. Modelling subalpine forest dynamics as influenced by a changing environment. Water, Air, and Soil Pollution 68: 185-197. Some demographic and genetic consequences of environmental heterogeneity for biological control. Bulletin of the Entomological Society of America 15: 237-240. Extinction. In: “some mathematical problems in biology” (Gesternhaber M ed.). American Mathematical Society, Providence, Rhode Island, USA, pp. 77-107. Immediate genetic changes in tree deployment and breeding because of global warming. In: “International conference on adaptation of forests and forest management to changing climate with emphasis on forest health: a review of science, policies and practices”. Umea (Sweden) 25-28 August, 2008. Book of Abstracts and Preliminary Programme, pp. 147. How to adapt forest management in response to the challenges of climate change? In: “Climate change and forest genetic diversity: implications for sustainable forest management in Europe” (Koskela J, Buck A, Teissier du Cros E eds). Bioversity International, Rome, Italy. pp. 31-42. Genetic resource impacts of habitat loss and degradation; reconciling empirical evidence and predicted theory for neotropical trees. Heredity 95: 255-273. Landscape fluidity - a unifying perspective for understanding and adapting to global change. Journal of Biogeography 36:193-199. 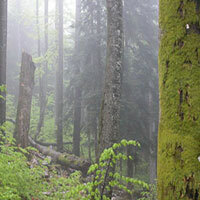 Climatic adaptation of trees: rediscovering provenance tests. Euphytica 92: 45-54. What do field trials tell about the future use of forest reproductive material? In: “Climate change and forest genetic diversity: implications for sustainable forest management in Europe” (Koskela J, Buck A, Teissier du Cros E eds). Bioversity International, Rome, Italy, pp.53-69. Reproductive biology of the dry forest tree Enterolobium cyclocarpum (guanacaste) in Costa Rica: a comparison between trees left in pastures and trees in continuous forest. American Journal of Botany 88: 1607-1614. Adaptation of forest trees to climate change. In: “Climate change and forest genetic diversity: implications for sustainable forest management in Europe” (Koskela J, Buck A, Teissier du Cros E eds). Bioversity International, Rome, Italy, pp. 19-30. Gene flow and local adaptation in trees. Annual Review of Ecology, Evolution and Systematics 38: 595-619. Metapopulation dynamics under climate change: will species be able to track? (submitted). Structure of the genetic diversity in Black poplar (Populus nigra L.) populations across European river systems: consequences for conservation and restoration. Forest Ecology and Management 255: 1388-1399. Natural hybridization between Populus nigra L. and P. x canadensis Moench. Hybrid offspring competes for niches along the Rhine river in the Netherlands. Tree Genetics and Genomes 4: 663-675. Genetic analysis of landscape connectivity in tree populations. Landscape Ecology 21: 821-836. Genetic maladaptation of coastal Douglas-fir seedlings to future climates. Global Change Biology 13: 1441-1454. What is a population? An empirical evaluation of some genetic methods for identifying the number of gene pools and their degree of connectivity. Molecular Ecology 15: 1419-1439.